The perfectly balanced pen has arrived. The team over at Shanpo have created an amazing pen set, and sent me a prototype to check out before they launch on Kickstarter. I also had an opportunity to ask them some direct questions on the design and their team. Using magnets, the pen stand holds the Hoverpen perfectly vertical. The stand and pen are not as heavy as I expected them to be and the more I look at them, the more it feels like a trick. I feel like the pen should tip over at any minute. My kids still think it is magic, and even though I have experience working with neodymium and ceramic magnets, I kind of feel like that too! I haven’t ever wanted a pen stand on my desk as I prefer a clean work surface, until now. This is one that I will always want beside me to play with and use. The pen cap clicks onto the base as a holding spot while I use the pen. Smooth ballpoint feel and good line weight without any skipping. Built from only 4 parts (Cap, Body, Refill, and End Cap) the design is very simple. Only the refill is branded in the version I received so there are no visible names or markings on the exterior. The pen weighs a mere 0.53oz (with the cap) and is 5 1/4in long. The ballpoint pen lays down a very fine line and is almost a dark grey color which is rather unique. Anyone writing with a bit of pressure can get a darker line if needed, but the lightweight pen matches the line weight perfectly. Further, the pen cap magnetically snaps back on with a satisfying “click” and the end cap slides on with such precision that it vacuum seals to hold the cap on tightly. The version I received to test is similar to that of the aluminum on my apple laptop. From their website it appears there will be four different color choices. Click the image to go to their Kickstarter project page. 1. How did you come up with the idea of the Hover Pen and how long have you been working on this? The Founder of Shanpo, David Liang, majored in physics in university, and studied electromagnetism. To him, the electric field and magnetic field are twins. There're so many people put efforts in developing electronic products, but very less people put attention to the magnetic. To us, we think that the pure magnetic fields are very "attractive" (pun intended) and with great potential to bring something new-amazing designs to life. Thus we've been thinking what we can do with magnetic forces. One midnight, it came to David's mind to combine magnets into our daily tool --- the pen. He wanted a very stylish and "attractive" way to stand on the desk. It had to be very stylish, so you can't help but want to pick it up and use it. We soon made the first prototype of Hoverpen. The way to stand the pen, at that time, was too simple, and we found there was already the same type of pen in the market (horizontally). 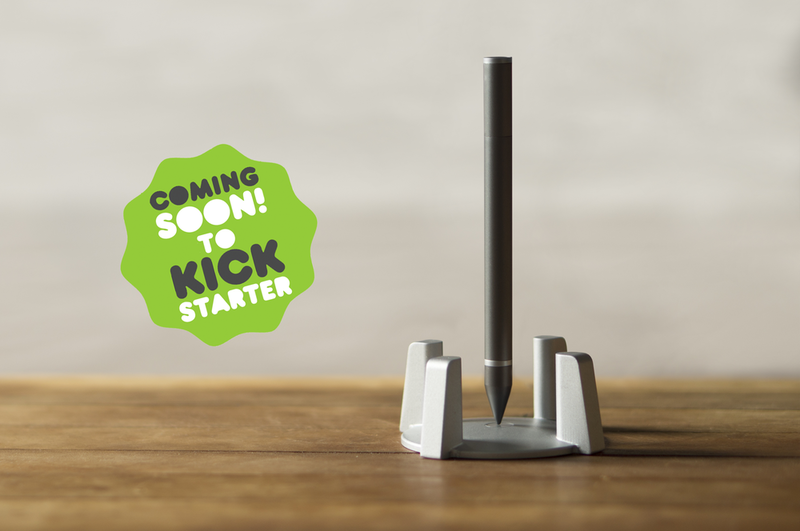 We didn't want to give up, so we spent a year making tons of prototype with various way to make the pen stand on its own. It wasn't easy, but finally, we cracked it. The Hoverpen was born. Now the latest Hoverpen allows you to spin it, it's easy to pick up, and the way the pen stands is stylish and unique. A must-have on one's desk. 2. Who is working with you to help design and build the pen? Shanpo, our brand, was established initially by David Liang and his friend, Wei. Wei was David's classmate from kindergarten all the way to senior-high school, so they grew up together. Wei is an industrial designer. All the visual elements of our products and brand are designed by Wei. Our core value is to create unique products with whole new experiences for grown-ups. 3. What is your personal background in designing and why are you interested in creating this pen? David majored in physics in university and studied business management in graduate school. Science always fascinated David. However, compared to academic study, he was more passionate about designing unique products that had a bit of mystery to them. He believes that the Hoverpen will amaze people with the magnetic, a natural force of nature. The fact that with the magnets, the Hoverpen can literally stand infinitely, without having to use electricity! David believes that the Hoverpen can literally "attract" people to write with pens again, instead of taking notes with electronic devices. Let's put down the phone and experience the enchantment of the Hoverpen! 4. Is this your first design project and first time using Kickstarter? To be honest, this is our second Kickstarter Project. Our first product was a "Stereo Puzzle", a user-friendly DIY speaker series, bringing you fun and functionality. Although the project successfully funded, and was even selected as a "Project we love" by Kickstarter, we didn't put much focus in marketing so it did not raise as much funds as we would have hoped. Equipped with more preparation and more experience this time, we hope to have a much more successful project with the Hoverpen. 5. How long do you anticipate it to take for production and shipping? After the quantity is confirmed, the estimated time to manufacturing time is 2 to 3 months, and we anticipate to take one months to pack and ship all the packages. This is a great looking pen stand and is fun to play with while brainstorming. I am excited for the Kickstarter launch and believe this will be a big project. I looked into their first Kickstarter project (a DIY stereo puzzle) and was impressed with their product, but more importantly they have great communication with backers and good solid updates on production. While I didn’t back this, I would have liked to! I look forward to backing their new project and wish them the best with their Kickstarter launch! 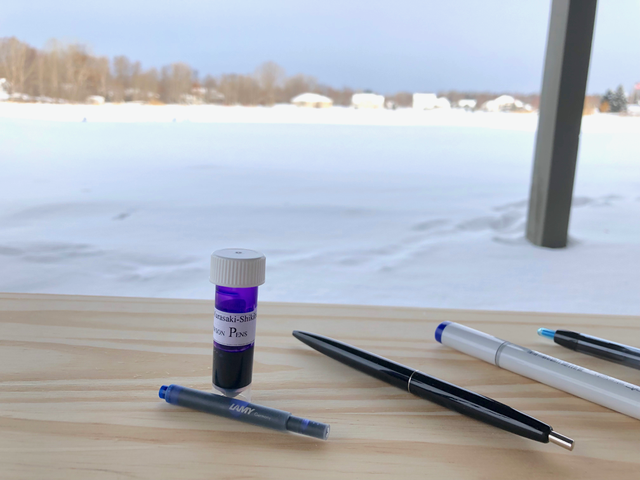 With the cold air temperatures rolling in, I decided it was time to test which of my pens will work outside, and also see what happens to fountain pen ink when subjected to the extreme cold overnight. I tested 11 pens that i use on a regular basis and left them outside for 24 hours. The temperature when I put them out was 10 degrees and the low for the evening was 0 degrees. The paper is a Clairefontaine ruled notebook and kept the paper the same for the before and after samples. The top line for each pen is the before freezing, and the second line is after the pen was left outside for 24hrs. After being in the freezing temp all day I tested the pens and every single one wrote exactly the same! This was surprising as the ink in the fountain pens is water based and the gel inks should have been affected. Looking closely at the TWSBI Go pen (blue pen in above picture) I thought it was frozen but perhaps it was just because it was full and didn’t look like it was moving. The pens didn’t even need any work to get them writing. I started writing as soon as they came inside and while they felt frozen, the ink flowed perfectly. Going a bit further, I wanted to find the freezing temperature of the inks but came up short. If anyone knows where to find this I am all ears! I know there are inks made specifically for cold temperatures like the Noodler’s Polar Inks that has a freezing point of -114 degrees. Find it here. After the first test of 11 pens, the weather dropped well below zero and I did a test with a mix of pens and fountain pen ink. I left these pens and ink out for 72 hours that went through two snowstorms, and a low temperature of -20 degrees. The result was fairly surprising once again….They all wrote very well after a little short ‘warm up’ period! The one that took the longest to get warmed up was the TWSBI GO and you can see the ink had a hard time flowing consistently. The ink didn’t freeze inside the pen so I attribute this to the nib being so cold. As for the ink sample, this was frozen solid as well as the Lamy cartridge. So, thats it for the cold tests. Thanks for reading and let me know if I should test any other pens or ink this winter! PS. In case you want to know which candy bar is best to pack on cold trips, the Butterfinger is your best bet. I learned this from my friend Sam that used to do this crazy race on the Canadian border called the Arrowhead 135. This is a race along the Canadian border in January that he needed to pack high caloric snacks with him. After lots of candy testing, the Butterfinger doesn’t freeze into a brick like a Snickers, FYI. Willpower is a resource that we need to spend time exercising and using wisely to avoid overwhelming ourselves and failing to achieve personal goals. This book helps explain what willpower really is, what it can do for us, and the limits of willpower. Supported by scientific studies and research, this is a self-help book without any of the fluff. 1. Willpower is a limited resource. You only have one source of willpower for all the needs of the day and the willpower to resist sweets uses up the same reserve of willpower for dealing with annoying coworkers. Each is using self-control and the studies outlined throughout the book show that these take a toll on us throughout the day. 2. Our environment can either help or hurt our willpower. After working hard to be patient and kind to everyone around us, it is vital to construct an environment that does not tempt us too much when our self-control is depleted. 3. Take on one big thing at a time. When trying to lose weight, it is best to focus your energy solely on this. This will require a lot of willpower and as this is a precious and limited resource, it will increase your odds of success. Further, at the end of the year, be sure to only make one New Year’s resolution. 4. Willpower is directly connected to Glucose levels. If your body runs out of glucose it will affect your decision-making ability and cause you to make bad choices. Our bodies will crave sugary foods to replenish the glucose levels and will make it harder to stick with diet goals. 6. Willpower can be strengthened with exercise. Like any muscle, the more you use it, the stronger it will get. By choosing things to exercise self control, like sitting up straight, overall willpower increases not only in posture, but in other tests as well. 7. There is something called 'Decision Fatigue'. The more decisions we need to make in a day, the more it will affect how we make the choices at the end of the day. This concept is demonstrated through multiple studies but the main point is this, if you are forced to make a lot of decisions in a short time, be prepared for the fatigue that sets in and know that you will need to work harder to make positive choices. To learn more about this concept click Here. 10. Self-control is the most underappreciated character trait. After reading this book it is clear that we need to put a higher importance in controlling ourselves. As shown in the Values in Action Inventory of Strengths study, self-regulation is typically last place when personally rating the list of character strengths. In summary, I wouldn’t say this is a must read, but it is a must listen to. The audio version is very well done with the intro done by the authors, and the main reader doesn’t add that typical self-help soft voice. You can find it Here. This book is perfect for anyone that wants to get their professional and personal life back on track. I first heard about this book from Myke Hurley and CGP Grey on the Cortex Podcast and they both gave it very positive reviews. The author, Marshall Goldsmith is a professional coach and has a unique method of getting his message across. He is also only paid after the people around the individual he is coaching agree that the subject has changed for the better. There is so much to unpack in this book as it is full of useful examples so to keep this review short, I’ll focus on a few of the main topics as to why you should read it. Once identifying the triggers that effect us, the book goes into how we react and process the impacts on us. By acknowledging we all have a mental “leader role’ in the morning, but by the afternoon we should take more of an ‘employee role’ and stick to what we set out to do by following a guiding system. The system to use is laid out in the second section of the book. Did I do my best to set clear goals? Did I do my best to make progress toward my goals? Did I do my best to find meaning? Did I do my best to be happy? Did I do my best to build positive relationships? Did I do my best to be fully engaged? While these are all very general, this is only the starting point for the questions that matter the most to you and your goals. Specific questions are encouraged once you identify what you want to work on, like eating fewer carbs. The transformative substance of the book explains that focusing on effort, rather than results, is the main objective in the short term. Each day if you asked yourself how well you tried, it makes you much more accountable. The daily questions are scored on a number system 1-10 on how well you tried to do something. Here are my own questions I came up with and so far after starting this program I have lost 5 lbs after 2 weeks. For my personal goals, the structure is what I had been missing in the past. 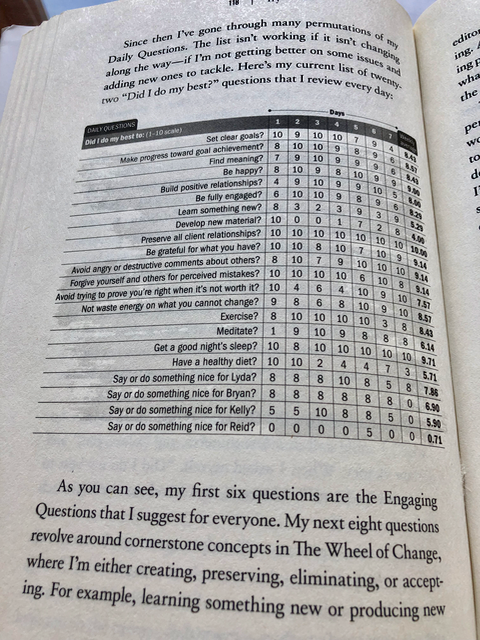 Once you have the data from the daily questions, or that you already know you would like to improve, the structure is there to help. The examples in this section provide evidence to show that by setting up things for yourself ahead of time, you will be able to achieve the goals you set out for yourself. This section also shows where you may suffer and how to get avoid failing. One of the main points made in this section deals with something called Emotional Depletion. I would say that this book is geared more to the professional life, but it has many personal aspects that make it a well rounded read. You can find it on Amazon here. I also recommend the audio book version as it is shorter than most books at about 6hrs. Here is a longer list of questions to get you started. To get you started on your own list of questions, I would like to host a giveaway for a free copy of Triggers, as well as a Leuchtturm1917 notebook with matching pen loop! Simply comment on this blog or on the social site about one thing you are working on to better yourself or want to work on. Drawing will be made on Friday, June 29 at 12pm EDT. Good Luck! For anyone that has gone into an Office Max or Office Depot in the past few years, you likely have noticed the large TUL pen display with hundreds of pens. I tried to ignore the shiny display of writing "tuls" but finally started trying them out and want to share my thoughts on the distinct writing/drawing experiences. To begin, the name TUL is written with a macron over the 'u' making the vowel long so it is pronounced "tool." I talked to the folks over at Office Max about these pens so you can find out more about the brand at the end of the review. Currently, the pens offered are Ballpoint, Gel, and Rollerball, and each comes in Fine (0.5mm) and Medium (0.7mm) points. They did have a marker pen in the past, but they did away with these. From time to time there are also limited edition colors available, and I’ll talk about these further down. Overall, all the pens write very wet. Even the ballpoint lets out ink much faster than any pen I can compare it to. If you like this characteristic, you will love the medium points as they put down a lot of ink, very quickly. I found this was a nice benefit the faster I wrote, but can get a bit messy. The ballpoint pens come in the standard colors of black, blue and red. After using these pens to sketch for a while, I noticed the ink has occasionally created a small glob. After looking at other reviews, this is not uncommon and may be created from the paper being used. I tried it out on some smooth Rhodia paper, and didn’t have an issue. The Gel pens come in a large range of colors and include some very bright color sets. These are perfect for those that like to add color to their bullet journals and planners. The ink is super smooth and the black ink lays down a very rich dark line. These are all retractable/click pens for easy transport and have sturdy clips. The color packs come in 8 or 14 sets. Gel ink color pack of eight. See the Giveaway section below for a chance to win this set! The gels also include a needle tip if you are going to use them with a ruler and both tip types are well constructed with no noticeable movement when writing. My favorite of the pens are the Rollerballs. These have a great overall design appeal, as well as a larger barrel diameter that fits very well in my hand. Again, they are quite wet even for a rollerball but the lines are still nice and clean if I write a touch slower. There are not as many color choices like with the gel pens, but the black is a great dark rich ink, and the blue is nice and bright. Finally, the TUL line-up also includes the mechanical pencil in 0.7mm. These have a solf rubber coating on the full length of the barrel and is a nice unique touch for pencils. The barrel is also slightly larger than typical pencils and fit well in my hand. The pencils are now offered in several color choices like blue, purple, pink and black. The really nice feature of these pencils is the 1 inch eraser built into the back of the pencil. It unscrews as you need it and fits securely to the end. The clip is the same as the pens and is solid. Something I also love about these pens are the limited editions they put out roughly twice a year. Currently, the "Bright's" color pens are offered, but there is a new one coming soon! See below in the Q&A for the date. A few of the previous limited editions are available on Ebay, and the rose gold pearl edition is getting quite expensive. A set of 4 ballpoints are going for $47! How do you come up with the new limited edition colors? We love our limited-edition colors because they allow us to showcase the pens our customers trust for outstanding performance in a unique way. Each limited-edition story and color palette is carefully selected by our in-house designers based on the anticipated trends of the season. We also recently introduced our exclusive line of TUL notebooks and accessories into these limited-edition collections. Can we start to get excited about a new limited edition or new product coming out soon? Earlier this year, we launched TUL Brights pens available in 14 vivid colors and note-taking system available in four bold limited-edition colors that TUL enthusiasts can purchase online or in store. Look out for our newest limited edition pen and notebook collection in stores and online in October – our most giftable TUL collection yet! What is the meaning/history behind the name TUL? TUL was developed by OfficeMax in 2006 as an exclusive writing brand that delivers affordable luxury to our customers. We strive to be the go-to tools for entrepreneurs and business leaders who are seeking products that inspire with design and are precision engineered for outstanding performance. Can you share how these pens are made or a bit about the design process? Each one of our TUL pens is precision engineered, hand assembled, and hand tested for outstanding performance. We take pride in ensuring our customers that our pens consistently deliver smooth, vibrant lines at first write. And, we believe the discipline and rigor behind the making of these products helps us deliver on that promise. I highly recommend you check these pens out and if you go this week they have some great Back-to-School sales. The clearance sections of the stores also have some good deals as well. Amazon carries them, but without coupons and sales available, the prices are a bit too high for my taste. Also available under the TUL brand are the customizable notebook systems. These are getting very popular due to the growing range of paper choices, cover colors, and sizes available. I haven't used these yet, but I know from friends that they are really handy. Check them out here. The disks hold all types of page refills depending on your needs. I picked up an extra set of gel color pens and want to give them away! Please sign up for my newsletter below to enter. Random drawing will be held this Friday at midnight for US residents. Sign up with your email address to enter. We respect your privacy and won't share your info. Ryder Carrol has released a beautifully designed app to work alongside your Bullet Journal. While this is not to be used as a replacement of the journal, it is a great resource and reminder tool. The main premise of the app is to encourage the user to reflect on the day with two reminder notifications. If you click on the notification you are rewarded with an inspirational quote and the satisfaction of crossing off the day off in the calendar. The Morning reflection helps to give the day purpose and the one at night helps review and catalog the day to help remember what you accomplished. Priced at $2.99, this app is designed for the beginner and intermittent bullet journaler that wishes they could remember to update their journal every day. For some journalers, this price will seem high as they don't need a reminder for something they do naturally. However, for the beginner just starting out, this app is a must have. The cost is the same as buying a pen loop or a new pen to use with the journal, but this app has some really nice features for those just starting up. Articles - If you are not convinced of the benefits on Bullet Journaling, or need some inspiration this is a collection of well-written blog posts. Guide - This is the collection of all the beginner videos introducing the core concepts on Bullet Journaling. Reflection - This is basic premise of the app and based on Ryder's recent TEDx talk about Leading an Intentional Life. Store - It is scary easy to buy a new Bullet Journal designed by Ryder and made by Leuchtturm. If you are interested in the app you can find it HERE. In case you haven't seen Ryder's TEDx talk, here is the video. I liked the analogy of shopping while hungry. If you have the app, do you have any thoughts on using it? Charles Duhigg (Pulitzer Prize-winning investigative reporter) has published his second book (author of The Power of Habit) and this one is a must read for anyone that wants to truly take control of their daily life. Why do so many people like cheap folios to carry their work around? For anyone that cares about picking the best folio and notebooks/notepads to carry their work, I hope this blog will help. Follow us for regular updates. Sign up for monthly updates, giveaways, and exclusive discounts on new products! We respect your privacy, we will never share your info with anyone.